Distribuya su tiempo en San Petersburgo en tres días con este recorrido por la ciudad que incluye transporte de ida y vuelta, todos los costos de entrada y acceso directo en la mayoría de las atracciones. Explore el Hermitage, el Palacio y Jardín Peterhof (Petrodvorets), el Palacio y Parque Catherine y el Palacio Yusupov. Además, vea la Catedral de Pedro y Pablo, la Iglesia del Salvador sobre la sangre derramada y la Catedral de San Isaac. Termine su último día de este tour con un relajante paseo en bote por los canales cercanos. Ve al Palacio Yusupov y al Palacio y Parque de Catalina. Incluye transporte de ida y vuelta y entradas. Hicimos el tour de tres dias y fue muy bueno. El guia compartio muchisima informacion, muy interesante siempre en relacion a la historia y la cultura rusa. Disfrutamos de cada actividad, muy bien organizadas y siempre con algo de tiempo libre. Tambien fue muy util que un chofer nos buscara en el aeropuerto y tambien nos lleve a la estacion del tren el ultimo dia. Lo recomiendo ampliamente!!! I have to say we received world class service from Stanislav and the Viator team. We were met at the train station by a kind and smiling driver who grabbed our bags, escorted us to his car and drove us quickly to our hotel. The next morning we were promptly met by Stanislav and we driven to our tour of the Peterhof. Stanilslav spoke perfect English and provided an exceptionally nuanced perspective of Russia today and great detail about the history of the city and the Romanov's. He was attentive and customized the tour to our needs, picked out interesting restaurants and thoughtfully answered our questions. St. Petersburg is an embarrassment of riches, or as Pushkin said the shame of Russia, such an amazing concentration of wealth. My personal favorite was the Yusobov palace and the tour of the room where Rasputin was poisoned and shot. My wife and I were somewhat reticent about visiting Russia, we've traveled a great deal and expected mishaps and coldness. The Russians were exceptionally kind and this trip went off without a hitch. 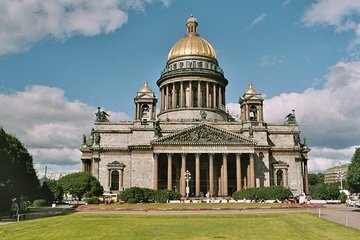 St. Petersburg and Hermitage must not be missed and if have the chance, use Viator and ask for Stanislav. It was a world class experience. This semi-private tour had everything! We saw all the sights from the canals of the city to the palaces of the czars with knowledgable Russian guides providing the history of the city from Peter the Great to modern times. One even sang arias for us. This was a mind and soul broadening experience which we'd urge others to share. This was the best tour I have ever gone on. Stan, our guide, was so knowledgeable, so professional. I was really blown away. Everything ran like clockwork. We saw everything we wanted to see and then some. This is an amazing city! And our tour was equally amazing. I cannot recommend it highly enough. Wondefull tour, definitly recomend. On your own it would be more expensive and traveling around the city would be complicated.